All three local Parkruns were open again this weekend. Frimley Lodge was the most popular with sixteen members in action from a total field of 531! Clive Rolfe was first to finish for the club in 20:18. Dave Ayling recovered well from last weekend’s South Downs Ultra attempt to record his best time at the shorter distance since 2016. Dave O’Toole had another great run in his 150th Parkrun! At Rushmoor a trio of SJs enjoyed guaranteed PBs in their first visit to the venue; Samantha Pittick, Hannah Glaister and Karen Page finished in that order and enjoyed some post race sprint training to boot! Samantha absolutely smashed it as this result is her fastest Parkrun ever! Seven SJs in action at Bracknell with Charlie St Aubyn first member to finish in 27:09 while Blanche Barnes recorded yet another PB in 33:13. Some quality Parkrun tourism this week with Patrick Wadsworth running 22:36 at Wilmslow and Lisa Hale combining the Osterley Parkrun with the 10K at the same venue. Lisa Hale ran the Osterley Park 10k in West London finishing in 46:27 finishing 4th in her age category. Stuart Overhill was in action in the South Downs Trail Half in 2:12:40. Amazingly Leon Hicks had a weekend off marathons but has booked his 100th so keep your diaries clear on Saturday 7th April 2018. Starting in Walton-on-Thames the course is an out and back 3.28 mile look alongside the Thames of which you can complete as many laps as you choose. Obviously Leon will be aiming for at least eight laps. John Collier was in action at the Ranelagh Harriers Richmond 10k. On a two lap course starting near Ham and taking in roads and the Thames Path with views of Teddington Lock and Ham House John completed the race in 1:15:59. Angela Foker and Claire Chase took on The Brutal race on a very tough 5k course around the Ash Ranges which included running, jumping, climbing and swimming. So tough in fact you could call it BRUTAL! Angela finished strongly in 6th position in her category with Claire close behind in 8th. Nigel Evans also ran the 10k Brutal but wasn’t satisfied with that punishment so went out again on Sunday and ran the Hampshire Hoppit Half Marathon in 2:44:07 which he described as the hardest race he’s ever done due to a combination of hills and heat. Jackie Kent made the trip over to Channel Islands and completed the Guernsey Half Marathon on a beautiful course along the northern coast. She took the tourist approach and took plenty of photos but still finished well under two hours and was rewarded for her efforts with a carton of milk as the event was sponsored by the local dairy. Patrick Wadsworth met the legend that is Ron Hill having completed the Dr Ron Hyde 7 in 55:30 on a hot, hilly and rural seven mile course in the North West. This week we had a new King of Strava with Neil Praine topping 100km and the leaderboard with a total of 103.9km thanks to an amazing performance in his Ultra. 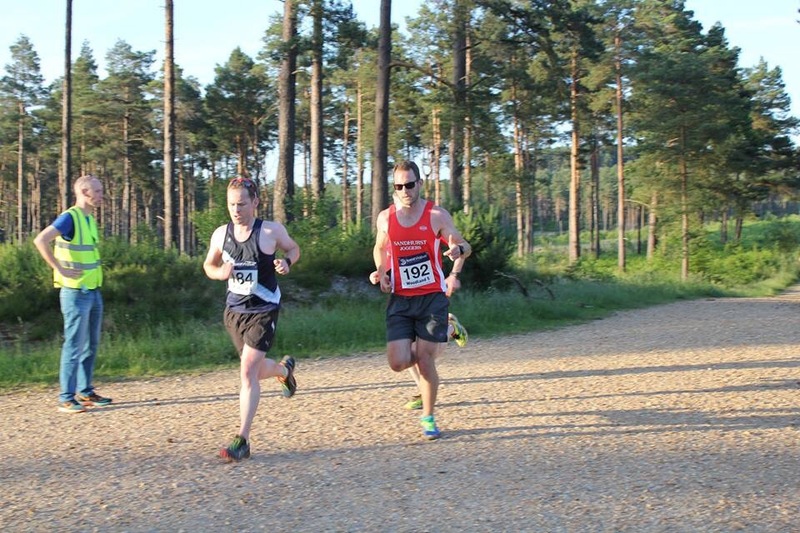 Marathon Queen Lisa Hale was back on the podium in second with 70.7km and Andrew Brooks was third with 66.6km as he ramps up for the New Forest Marathon in august. Sixty-three members logged runs this week. To take part in this just create a free Strava account and link it to the club in your profile. Tuesday: This week is the Tuesday Pub Run starting at 7pm from The Swan in Ash Vale. You’ve already missed the food pre-ordering deadline so won’t be able to add anything to the group boking but will be able to order food seperateley and buy drinks at the bar. Monica and Mike have some lovely routes lined up for all abilities. Later the interval sessions will meet at The TYTHINGS in Yateley at 8pm where the Jenny has a tough but beneficial session ready for you.